A memorial window in the private chapel of Bishop Selwyn’s Lichfield Cathedral in England is dedicated to to the compassionate actions of Ngāi Te Rangi leader Hēnare Wiremu Taratoa during the Battle of Gate Pa at Pukehinahina on 29 April 1864. Taratoa brought a calabash of water to mortally wounded enemy British soldier Lieutenant-Colonel Henry Jackson Parkin Booth. Taratoa was later killed by the British during the Battle of Te Ranga on 21 June 1864. Story by Debbie McCauley. 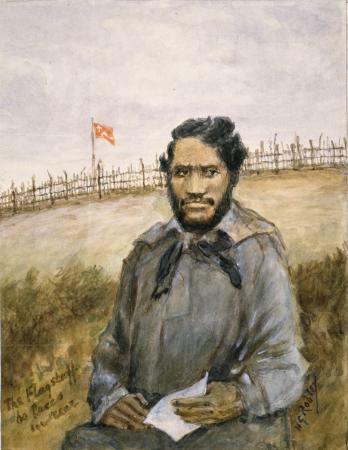 Ngāi Te Rangi leader Hēnare Wiremu Taratoa was born at Opounui on Rangiwaea Island in 1830 to Hera and Hoani. Hera was connected to Otamataha Pa at Te Papa which was destroyed in 1828. The English translation of Hēnare Wiremu is Henry Williams. Taratoa lived at Opounui Marae on Rangiwaea Island which is located near Matakana Island in the Tauranga Harbour. From about 1845 to 1853 Taratoa was taught and baptised at St. John's College by CMS missionary Henry Williams (1792-1867). He travelled extensively with Bishop George Augustus Selwyn (1809-1878), assisting with his religious mission. At Kawakawa on 3 April 1850 Taratoa married Emily Te Rua, from the Kisslings' school in Parnell. Their daughter, Ani Paraneha Ann Frances Taratoa, was born on 19 January 1852. Emily died on 14 November 1852 and was buried in the grounds of St John's College in Auckland. On 11 October 1854, Tarata married Rahapa Te Kawa at Otaki where he had become the schoolmaster. The couple had three children together; Ana Keita Taratoa (1856); Hera Ana Taratoa (1858) and Pereika Wiremu Taratoa (1860). In 1861 Taratoa, Rahapa and their children moved back to Tauranga. At Poteriwhi, the pā of Pene Taka Tuaia on the lower Wairoa River, Taratoa wrote up the Potiriwhi Code of Conduct. Taratoa also wrote a Challenge to Colonel Greer, giving as the reason for war aggression by the British troops. It is recorded that during the Battle of Gate Pā at Pukehinahina on 29 April 1864, Taratoa narrowly escaped being shot by soldiers whilst bringing the wounded Booth a calabash of water. Taratoa was killed during the Battle of Te Ranga on 21 June 1864. After the battle ‘on Hēnare’s body was found the Poteriwhi Code of Conduct along with the words in Māori... If thine enemy hunger feed him, if he thirst, give him to drink’ Romans 12:20 (Ki tematekai tou hoariri, whangainga: Ki te matewai, whakainumia) (Cowan, 1983, p. 439). Taratoa's body was initially buried in the trenches of Te Ranga, but later moved to Tauranga's Mission Cemetery (Otamataha Pā). The white marble frieze on the obelisk to Rawiri Tuaia Puhirake in Mission Cemetery attributes the act of bring water to the wounded at Gate Pā to Taratoa. Depicted is a mortally wounded Booth lying at Puhirake’s feet whilst Hēnare brings a calabash of water. Taratoa Street in Merivale, Tauranga, was named after him. A memorial window in the private chapel of Bishop Selwyn’s Lichfield Cathedral in England is also dedicated to Taratoa and his heroic act. As stated in The Journal of the Polynesian Society: “Photograph of a window in the Bishop's private chapel adjoining the palace at Lichfield. Installed by Bishop Selwyn, formerly Bishop of New Zealand, in commemoration of the Christian and chivalrous actions of Henare Taratoa in council and in the fights at Gate Pa, April 29, 1864, and at Te Ranga, June 21, 1864, and who was killed in the latter engagement. The design represents David pouring out the water which the three soldiers had fetched from the well at Bethlehem at the risk of their lives (I Chron. xi, 17-19)” (Volume 36, 1927, No. 144, p 401). TAHARANGI The death occurred at Opunui last week of a very aged lady named Rahapa, the wife of the late chief Hone Taharangi, who died last year. The deceased lady's first husband was Henare Taratoa, who drafted the conditions of war for the engagements at Gate Pa and Te Ranga. These conditions gave protection to European women and children and men not carrying arms or connected with any engagements, and that they were faithfully carried out by the Ngaterangi tribe is evidenced by the action of Rawiri at Gate Pa when Colonel Booth fell. Hone Taharangi was also in the same engagement and lost one of his legs. A very large tangi is being held. Bay of Plenty Times (20 April 1914, p. 4). Curteis, Herbert George (1889). Bishop Selwyn of New Zealand, and of Lichfield: a sketch of his life and work, with some further gleanings from his letters, sermons, and speeches. Davidson, Allan K. (2011). A Controversial Churchman: Essays on George Selwyn, Bishop of New Zealand and Lichfield, and Sarah Selwyn. Dixon, Ngahuia (1990. Updated 30 October 2012). Henare Wiremu Taratoa. (Dictionary of New Zealand Biography. Te Ara - the Encyclopedia of New Zealand). Gate Pā and Te Ranga. In The New Zealand Wars: a history of the Māori campaigns and the pioneering period: volume I: 1845–1864 (pp. 421-440). (1983) by J. Cowan. Wellington, New Zealand: P. D. Hasselberg. (Originally published 1922). Gibbs, D. (August 2009). Henare Wiremu Taratoa (The Elms Newsletters). Mair, Gilbert (1926). The Story of Gate Pa, April 29th 1864 [Reprinted by the Bay of Plenty Times Ltd in 1937 & 1964. Reprinted by Cadsonbury Publications in 2010. Reprinted by Tauranga Charitable Trust in 2014]. McCauley, Debbie (5 August 2011). Identity and the Battle of Gate Pa (Pukehinahina), 29 April 1864 (Tauranga Memories: Battle of Gate Pa, 1864 kete). McCauley, Debbie (2014). Taratoa and the Code of Conduct: A Story from the Battle of Gate Pā. Otaki Maori Land Court Minutebook (22 September 1881). Press (2 November 1912, p. 9). The Journal of the Polynesian Society (Volume 36, 1927, No. 144, p 401). Tucker, H. W. (2011). Memoir of the Life and Episcopate of George Augustus Selwyn, DD. : Bishop of New Zealand, 1841-1869, Bishop of Lichfield, 1867-1878, Part 4. Battle of Gate Pā 1864: Who gave water to the wounded?